The benefits of a low fat, whole foods plant-based diet have been established with years and years of research. Such a dietary approach is found among the longest lived people on the earth, who also have the lowest incidents of heart disease, diabetes, obesity and a multitude of other chronic illnesses that plague our nation today. Prevent and Reverse Heart Disease, Caldwell B. Esselstyn, M.D. The Starch Solution, John McDougall, M.D. Dr. Neal Barnard’s Program for Reversing Diabetes, Neal Barnard, M.D. 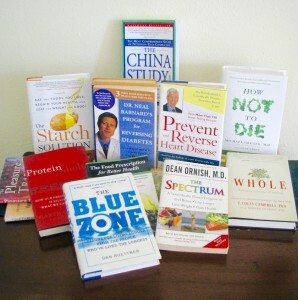 How Not to Die: Discover the Foods Scientifically Proven to Prevent and Reverse Disease, Michael Gregor, M.D. Power Foods for the Brain, Neal Barnard, M.D. Breaking the Food Seduction, Neal Barnard, M.D. 21 Day Weight-loss Kick start, Neal Barnard, M.D. Below are a few of the studies and articles supporting the benefits of a WFPB diet.